Dieffenbachia is native to Central and South America where it may grow to 3 meters in height. Dozens of species exist, each with characteristic white or yellow markings on the leaves. These may be spots, lines, or splashes of colour in the center of the leaves or along the edges. A few of the more common species are ‘Camille’, ‘Tropic Snow’, ‘Nicolette’, and ‘Tropic Sun’. 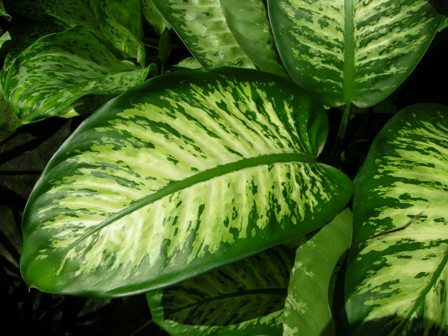 Dieffenbachia are relatively easy to care for. They require medium light, such as in a north or east window. The soil should be well drained, and kept slightly moist. They do not tolerate excessive moisture, as the canes will rot easily. Although rare, Dieffenbachia can be affected by spider mites or mealy bug. Inspect the leaves and stems regularly and wash off any pests promptly. They are also susceptible to bacterial infections; slimy rotten leaves are the symptoms of this. Cut off any affected leaves immediately. Regular fertilizing is important too. Fertilize monthly with a complete house plant fertilizer spring, summer and fall. Dieffenbachia tend to drop their lower leaves. The entire stem can be cut back when this happens. New shoots will form from where the stem was cut. Cuttings can be placed back into the soil at the base of the plant. Dipping the cuttings in a commercial rooting hormone mix will increase the chance that the cutting will survive. Tall plants may need to be staked. Re-potting into a larger container is rarely necessary and can actually be harmful to the plant. Dieffenbachia are occasionally used as tropical office plants. They are less tolerant of temperature and humidity fluctuations though, making them a bit more difficult to care for in a commercial environment.